The mining industry started to suffer in the mid 19th Century with falling prices as cheaper lead was imported from overseas and by 1880 the industry was in terminal decline. This lead to poverty and ultimately familes had to move away from the Dales. Some moved to the cotton towns of Lancashire whilst others looked for mining work in the coal fields of Durham, Lancashire and the West Riding of Yorkshire. Others emigrated to continue mining in America and other parts of Europe. Miners’ cottages were left empty and a silence fell on once boisterous villages. The silence wasn’t really disturbed until the advent of tourism with the formation of the National Park. The result of this was that mines were left as they were when the miners finished working, with tools and machinery left as if they had just left a shift and would return the next day. Gradually the buildings fell into disrepair and farmers and landowners started to reclaim the stone to build and repair barns and walls. Anything that could be sold was sold for a profit, e.g. the furnace arches from the Old Gang Smelt Mills were sold in 1933 for £25 to Muker Chapel and buildings were sold to builders to reclaim dressed stone. Some mines remained open until 1912 but the miners and companies were fighting a losing battle and ultimately they had to close. In recent years some of the materials that the miners considered waste (fluorspar and barites) have become useful in their own right and some spoil heaps have been picked over to remove useful products and the left over waste used to repair eroded footpath surfaces. 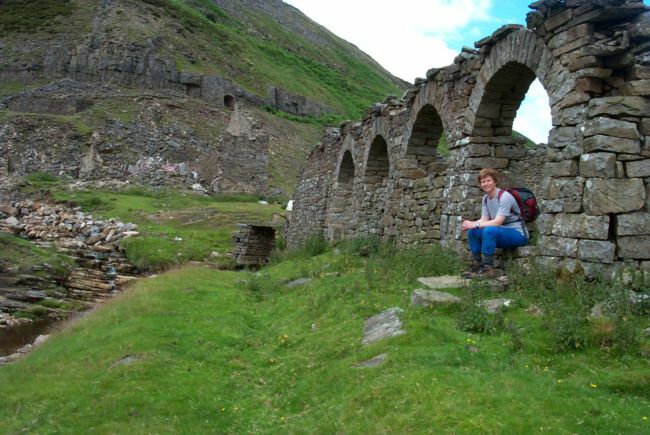 Lead mining has left a lasting mark on the landscape which visitors view with a romantic nostalgia as they stroll past ruined buildings, workings and spoil heaps on summer days. We should not forget the harsh realities of life for men, women and children who tramped across the fells in all weathers to work in damp, dark and extremely dangerous conditions.